Loom beading is an incredibly beautiful and versatile craft. Instead of just beading on a single strand, loom beading allows you to make intricate patterns even if you don't have a lot of experience with this type of beading. When most people think of a beading loom, they may think of the small looms they had as children. 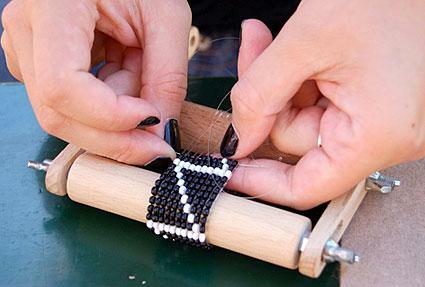 This type of loom allows you to mimic Native American style beading and usually only allows you to craft with tiny seed beads. This loom has a bent wire frame with wooden rollers. You can use it to weave simple bracelets, headbands, or trim with seed or pony beads. These are inexpensive and fun, but they are not the only types of looms available. You should think about what types of projects you will be doing with your loom before you buy. For example, if you want to work fiber as well as beads, you will need a bigger loom. You will also want to consider what size beads you will want to use before you buy a loom. Most looms are made for beading seed beads, but there are some higher-end looms that allow you to use larger beads or that are adjustable to different sizes. You will pay more for this type of loom, but if you plan to use it often and have different kinds of projects you want to do, the loom with the most options that you can afford will be the best loom for you. You should be able to go to your local craft store and find a loom or two, but if you are looking for a large or a specialty loom, you may have more choices on the Internet. Mirrex carries several types of looms in addition to the traditional beading type. There are seven different sizes of beading looms to handle every project imaginable. Crazy Crow offers several styles of beading looms, including a mini loom as well as an Ojibway loom and two adjustable loom sets. Fire Mountain Gems carries a great selection of looms and co-ordinating supplies. Some looms are made from wood; others are made from stainless steel, plastic and other materials. You can easily make your own loom out of cardboard and weave simple beading patterns. You will need heavy corrugated cardboard that is 18 by eight inches in size. Using a craft knife, cut the cardboard into a cross shape. Holding the cardboard, move in two inches from each side edge and cut down three inches from the top on each side. Now repeat on the bottom edge. You will have a cross shape with an eight by 12 inch horizontal bar. Score the flaps, which are the outer two inches on each side. To score, run the craft knife halfway through the cardboard. Fold the flaps up. Now score the ends and fold them up to make a rectangular box. Glue the edges together with a heavy duty glue like wood glue. Allow to dry. Cut 1/8 inch deep slits along each narrow edge of the box, spacing them evenly. Punch a screw, a large pin, or a small dowel into the narrow side of the box on each end. This will hold the threads and be an anchor for your project. If you want a more permanent loom and you have a little woodworking ability you may be interested in this wooden beading loom that you can build yourself. Take a look at your loom. Most have screws on both ends for securing the thread. Use zero-weight thread (or the type of thread recommended by the manufacturer of your loom) and tie a knot in the end and secure it to one of the screws. Slide the thread through the slot on the opposite side, and go back and forth until you have enough rows for your project. Remember that the beads actually sit between these rows on the loom, so you will need one more row threaded than you have beads across the width of the project. So if your piece is going to be 10 beads wide, you need to thread through the loom 11 times, so there are 10 gaps for beads on the frame. Secure the ends of the threads. Weave a new strand of thread through the rows a couple of times to stabilize the project. Tie this new thread to the thread on the right edge of the loom, and work from right to left. Start adding the beads in pattern. String on your first row, making sure the beads fall in between the threads on the loom. When you have the row completed, bring the thread over the top of the loom and push the row of beads so that they are straight and flush against the rows of plain weaving you did. Slide the needle back through the beads in the opposite direction, being careful to keep the thread above the threads on your loom. This ensures that the beads will stay secure. Continue to work in this manner to finish your pattern. When you reach the end, weave the thread through a couple rows again like you did at the beginning. Take it off the loom and fold over the end threads. The process sounds complicated, but it's really not that bad once you get started, and you will gain confidence quickly with practice. 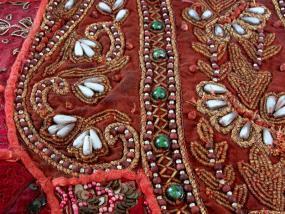 There are numerous sites offering free bead patterns for beginner to advanced beaders. Beading Daily has patterns for four bracelets, including one that features flowers and a dragon fly. Kyal's free site has a few patterns with a pagan flair. All Free Jewelry Making offers nearly a dozen free loom patterns to keep you busy beading. Of course you can also make your own original patterns for the bead loom. Most people who design their own patterns use graph paper and colored pencils to plot out their designs. First you need to have some idea of what you'd like to make and what you'd like the finished product to look like. Figure out how wide and long you need it to be, then sketch out a drawing. Use graph or plain paper to sketch out your design. Using a clear piece of graph paper, color in each square to represent a piece of the pattern. Then, recreate it on your loom. If you've ever worked on a textile loom, or you enjoy working with beads, a bead loom could be a way for you to explore within your medium. Even if you've never done this type of crafting before, creating and working with the pattern can be done by anyone. Give loom beading a try and see what you can create.